Could there be a better combination? Yum! One of my dear, dear students had her last day with us on Thursday so I wanted to mark the event with a special treat. After an epic pinterest fail with some "Snickers" themed cupcakes the previous weekend, I settled on something a tad simpler and totally redeemed myself! To make the cake, I just used a chocolate cake mix (because I still haven’t found a scratch recipe that I like. If you have any recommendations, please comment!) Whip it up per the box's instructions and set aside. For the peanut butter filling, mix ½ cup of peanut butter, 3 oz of cream cheese, 3 tablespoons of sugar and a tablespoon of cream. Whip it up with your mixer. 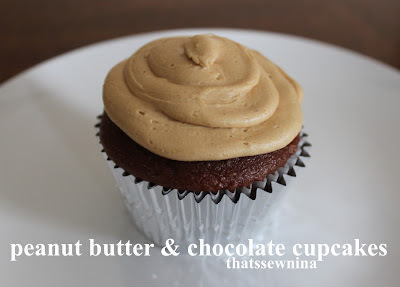 Fill your cupcakes ½ way up with cake batter, drop in about a tablespoon of the peanut butter batter and top it off with a little more cake batter. (My ratio on the filling was a bit off so you'll likely have extra.) Bake the cupcake according to directions on your cake mix. Allow to cool thoroughly before topping it off with icing. Combine the powdered sugar, peanut butter, butter, vanilla, and salt. Mix on medium-low speed until creamy, scraping down the bowl with a rubber spatula as you work. Add the cream and beat on high speed until the mixture is light and smooth. The inside of the cupcake. The peanut butter filling mixes in and looks just like the cake but it's a yummy peanut butter surprise. It did sink to the bottom... but as others told me, that kinda worked so that you got peanut butter on the top and bottom with chocolate in the middle.